Caring Transitions of Del Sur serves 4S Ranch, Rancho Bernardo, Poway, Scripps, Escondido, Del Sur, Fairbanks Ranch, Santa Luz and the surrounding areas. Working with Caring Transitions isn’t about a business transaction; it’s about creating a relationship and working together to help you reach your goals. This is personal for us. After helping with the clearing of multiple estates and relocating two parents, Cheryll and Kale Evans understand how overwhelming some of life’s transitions can be. That’s why they’re pleased to announce that they’re building a resource for other families with their new business, Caring Transitions of Del Sur. Caring Transitions’ specially trained team can handle organizing, packing, de-cluttering, moving, resettling, in-person and online estate sales, liquidations, and preparing homes for market. Caring Transitions is America’s largest resource for managing senior relocations, but the services are also perfect for busy families and individuals in need of assistance. Caring Transitions of Del Sur serves 4S Ranch, Rancho Bernardo, Poway, Scripps, Escondido, Del Sur, Fairbanks Ranch, Santa Luz and the surrounding areas. In addition to relocating Cheryll’s mom, the two also helped clear Cheryll’s dad’s estate in Nevada and relocate Kale’s mom to Texas from her house in California. Whether your situation is planned or unexpected, Caring Transitions’ services are perfect for seniors moving in with family, assisted living, or into a safer living situation as well as busy families and people clearing out the home of a loved one who has passed. All of Caring Transitions’ services are customizable, so clients only pay for the services they need – whether that means managing the entire move and estate-clearing or just getting someone resettled into their new place. Although Caring Transitions specializes in senior services, they can also assist with military or corporate relocations as well as relocations resulting from a divorce. Kale has been involved in the community over the years through youth and high school sports coaching and refereeing. 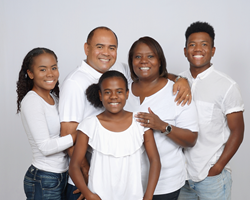 Kale and Cheryll are high school sweethearts – they’ve been together for 33 years, married for 25 years and they have three children, Kale, Kaia and Kyra, who are all active volunteers. Caring Transitions of San Diego is insured and employees have been background checked. For additional information, call (858)218-0775, email CEvans(at)CaringTransitions(dot)com or KEvans(at)CaringTransitions(dot)com, or visit http://www.CaringTransitionsDelSur.com.